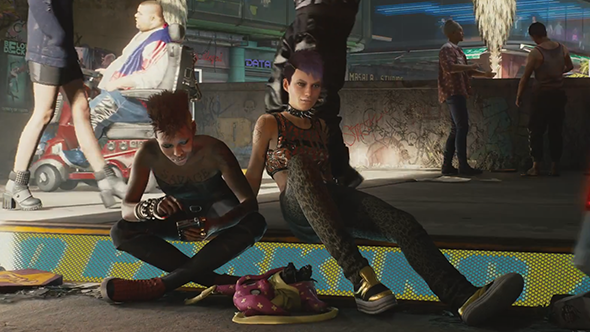 NPCs in Cyberpunk 2077 will move differently depending on their factional affiliations. That’s according to Maciej Pietras, cinematic animation acting lead at developer CD Projekt Red. Pietras worked on The Witcher series too, and at E3 this week we took the chance to ask him how characters and NPCs move differently in a cyberpunk universe versus a fantasy one. What does an animator do to make them behave like someone who would fit into their respective worlds? Hopped up on E3 hype? No need to come down just yet – go ahead and ingest our list of exciting upcoming PC games. The question came up because we were interested in how you make a character fit into their world through the way you animate them. The way a character walks, stands idly, and moves generally says a lot about them. Clearly that’s on the mind of Pietras and the rest of the animation team, as the game is full of groups from different walks of life who live on top of each other because of the overpopulation fo Night City. We now know more about the city and its six districts, some of the characters you will meet and deal with, and a great deal about the combat and how the stats of the pen & paper game factor in. So, now we just have to play the waiting game. I mean, we’ve waited five years already, we can keep going, right? Right?